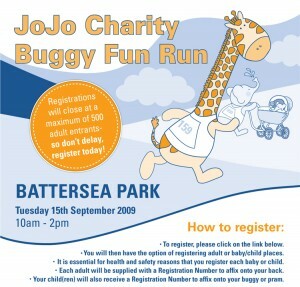 The JoJo Charity Buggy Fun Run is designed to be suitable for all levels of fitness. With advice from the Battersea Park Events Team we have created a course through the park which involves a 2.5km circuit. Runners or walkers may target themselves to cover one circuit of 2.5km, two, three or even four circuits making a total run of 10km. There is no pressure to take on more than you feel is right for your current level of fitness, but this system leaves you the option of setting yourself a higher target for the next JoJo Charity Buggy Fun Run in May 2010! The Buggy Fun Run will be more than an excuse for setting yourself a target in which to “get fit”. After your run or walk, stay around and enjoy the music and the baby fair. Bring a picnic rug and stay in the park for lunch with friends and family. Taking part and raising sponsorship will make all the difference to less advantaged parents, babies and children. Even if you decide not to take part in the Buggy Fun Run, join us in the park and take advantage of the entertainment, music and catering facilities. Bring a picnic and enjoy the atmosphere in the company of like minded parents, babies and children. We welcome entrants who have Buggy Boards or similar platforms for toddlers to stand on. However, for safety reasons these entrants must walk the circuit(s). In your entry pack you will receive a Sponsorship Form. Raising sponsorship will really make a difference to Nema, this small charity where every penny you raise will go towards funding projects to help babies and children on the ground in Northern Mozambique, where infant mortality runs at 30%. Alternatively, you may raise money for a local charity of your choice.